Although diversity of services makes RA unique, it is our employees that set us apart from the competition. The workforce at Residence Artists includes carpenters, painters, paperhangers, artists, furniture restoration specialists, and job superintendents. 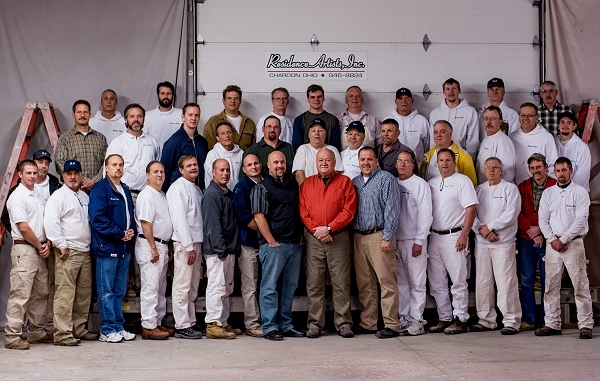 Our customers often complement our workers’ attitudes, cleanliness, dedication, and service. The ability to cater to clients’ needs while producing the highest quality product is part of what makes the RA team truly special. In addition to the full-time employees, Residence Artists has teamed with the finest subcontractors and trades in the area in order to take a job from start to finish. Many of our subcontractors work almost exclusively with RA. This allows us to avoid competing with other general contractors for the subcontractor’s services, and enables them to offer immediate service assistance to RA’s customers. Whether it is roofing, masonry, electrical, HVAC, plumbing, flooring, tile, or any other construction related service, RA has access to the very best that Cleveland can offer. Unlike many general contractors, an RA employee is sent with subcontractors to oversee each task and ensure a satisfying completion. Residence Artists’ 12,000-square foot warehouse facility adjacent to the Chardon office is fully equipped with two paint spray booths and a spacious carpentry shop. This enables us to perform fine finishes in a controlled environment without inconveniencing our customers. The shop is regularly utilized for projects such as restoring furniture, back priming and applying a first coat of paint to redwood or cedar siding prior to installation, and painting shutters during the winter months. The Residence Artists team has the resources to make dreams reality. RA is experienced in kitchen and bath design and can offer advice and guidance. For larger projects, RA can recommend a decorator or designer. For construction projects, RA works hand-in-hand with some of the best residential architects in the city. Together, they are able to assemble a plan that not only gives a customer what he or she wants but one that also works mechanically to eliminate the necessity of multiple "change orders."